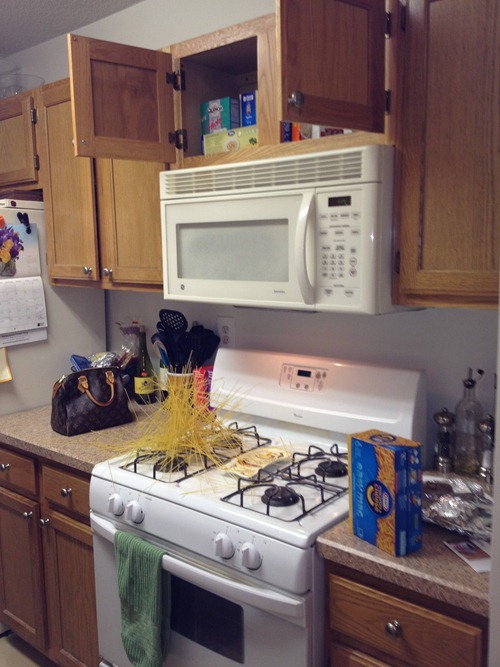 In a drunken stupor, I accidentally dropped an open box of spaghetti and it landed in this form on my stove. 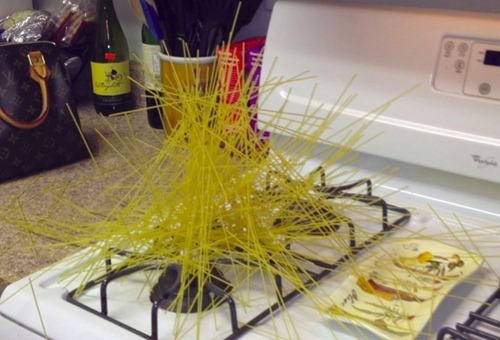 Random accident or evidence of the FSM’s influence over all things? Or maybe it was the aliens that have been transmitting orders to me to eat more ice cream. It’s much easier to unaesrtdnd when you put it that way! The “fsm” is not almighty. I HATE…etc. Why is The FSM not almightly? Provide your evidence rather than rant: you are in danger of becoming tiresome and boring. The FSM is not almighty because it is food. How can food create the world? P.S. Do you know who called me a “little twerp”? I HATE THE FSM: Could you please give me your very best reason for saying that Jesus and God aren’t false. In other words, please demonstrate to me why they are true. Here is a good opportunity to convert me to your faith. Don’t try turning the tables and saying “Well, you’ve got to prove that the FSM exists.” Don’t try the old “Well, you wouldn’t believe anyway because y’all wanna sin.” Just come straight out with a first Peter 3:15. MSB’s photo looks like our beloved FSM having a bad hair day. The FSM is definitely almighty! The evidence is at least as great as saying Yahweh/Jehova/Allah is almighty. Except YJA isn’t and FSM is. Check your facts: Allah and Yahweh AREN’T the same god! Aren’t they? Judaism, Christianity and Islam all come from the same Abrahamic belief system. Dear HATE, all of the three pretend gods that Keith mentioned are equally nonexistent, therefore, they are the same god! It doesn’t matter how many times you add zero to zero, you always end up with zero. ……sorry, but geodee is a zilch. HATE… so, how many gods do you NOT believe in? Thousands? Millions? Many people simply believe in one less god than you. Are you saying that the Abrahamic religions have different gods? And, the Bible swaps gods between testaments? That’s heresy! Dear Cap’n, there are an infinite number of nonexistent things to NOT believe in. HATE just chooses to pretend to believe in one nonexistent thing. I would say that is discrimination against all the other nonexistent things, wouldn’t you? …..but what do you expect from someone whose name is HATE? The Sauceror, it’s just so unfair! I keep thinking of infinite things that don’t exist and then quickly remember that I mustn’t believe in them. It seems to be….so….endless. But, I’m never one to quit. If I have FAITH, surely, they will then exist? Read the article Addicted To Hate for an insight into a hater’s disfigured psyche. Long, but, gripping and worth the effort. Lovely responses from our crew. Well Done, lads ‘n’ lasses.